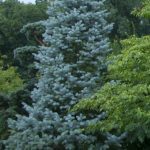 Since I released my Guide to Selecting Shade trees, I have meant to write a post about the most frequently recommended tree from it. 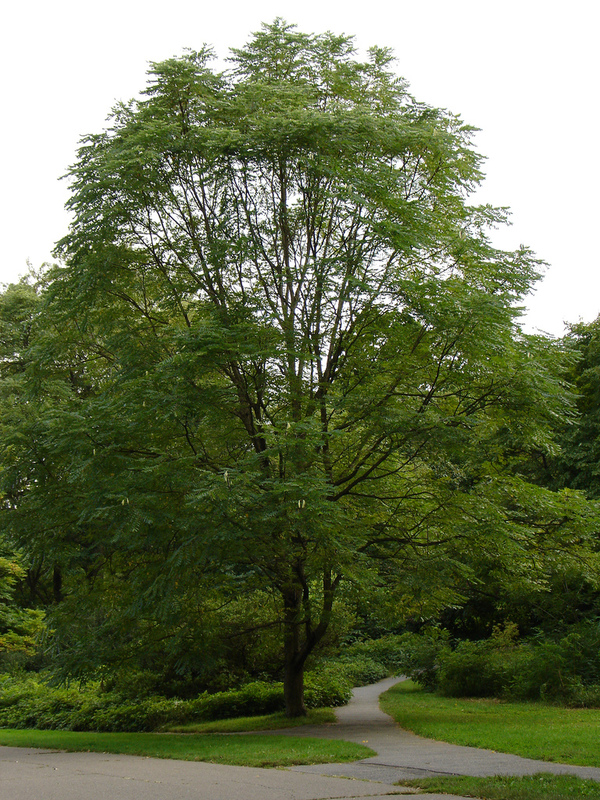 Here it is, the Espresso Kentucky Coffeetree. 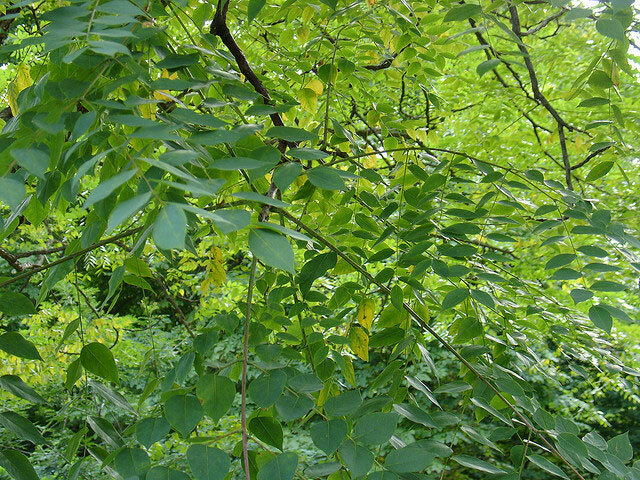 So what makes the Espresso Kentucky Coffeetree so special? No, it’s not that you can brew coffee from it. Early settlers did brew a coffee like drink from the seeds. I am guessing most people would prefer old coffee from any dumpy gas station before that beverage. Especially considering the seeds are poisonous. 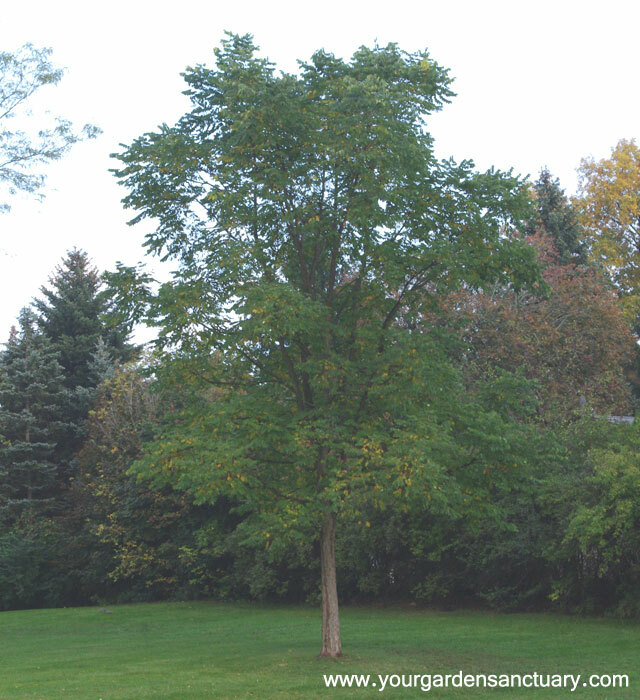 Here is a Kentucky Coffeetree that is a bit older. 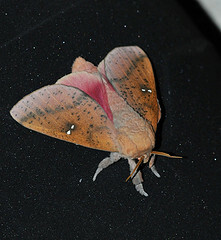 The Honey Locust Moth is a native that feeds on the Kentucky Coffeetree. Don’t worry you won’t even notice they have taken a bite. It is native and supports native wildlife. Although since the seeds are poisonous, they are mostly avoided by mammals. The Honey Locust Moth does feed on it’s leaves. Bumblebees, Tiger Swallowtail butterflies, and the Ruby Throated Humming bird visit it’s flowers. The seed pods are not unattractive, but some people consider them messy. ‘Espresso’ is seedless. Features: Picturesque vase-shaped form. Bold and attractive branch structure. Large compound leaves. It has a similar leaf to a walnut tree but is without that trees problems. Growth Habit: Upright vase shaped form. Fall Color: Yellow. Some years very attractive, some years not much. Fall color quality is not reliable. Here is how it looks in the winter with no foliage. Water deeply when first establishing the tree. After established,it is very adaptable to both dry and moist soil. It also grows well in acidic or alkaline soil. It should do just fine under most home landscape conditions. It is also tolerant of salt and pollution. 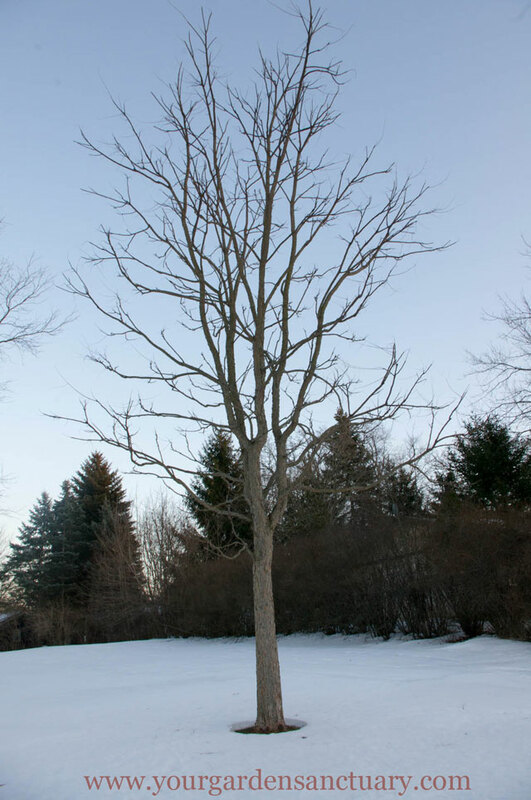 Espresso Kentucky Coffeetree is best pruned in late winter. Thanks to it’s poisonous leaves, deer leave it alone. Verdict: When I was researching the best trees for different growing conditions, this tree kept coming up. 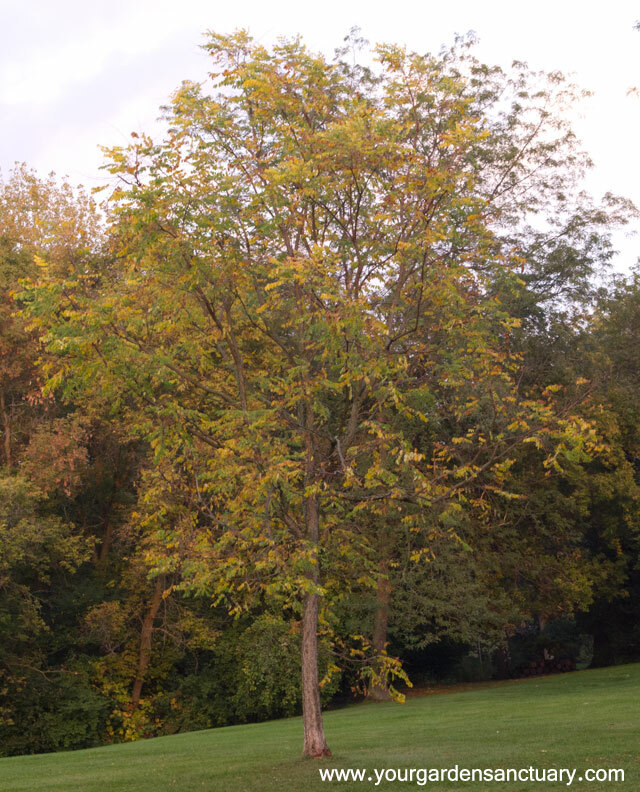 If it had reliably good fall color, it would be close to the perfect shade tree. 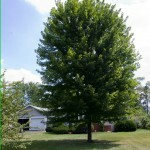 The next time I plant a large shade tree, there is a good chance it will be this tree. Highly recommended. Just found your website by the “Espresso” Kentucky Coffee Tree entry. Nice clone, BTW. Is it a male that’s grafted, or is it from root cuttings? I have a Kentucky Coffee Tree that I started from seed, and it is growing slowly in Palm Desert, CA. I collected it in Kansas, so it is a memory for me. Unknown if it is male or female, but I don’t believe pods will be a problem: I’m betting it’s the only one in Palm Desert. Recently, I discovered a new Caesalpinia for me, C. mexicana. 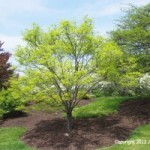 It’s a small tree (smaller than the Eastern Redbud another favorite of mine), and should be very adaptable as a small patio shade tree, with beautiful yellow flowers. However, even though it is a U.S. native (barely), it is very subtropical, and would not survive very far north. If you want to expand your database to the Southwest, it’s worth mentioning. I don’t know for sure how it is usually grown, but I know they can be grown from root cuttings or tissue culture, so I bet it is NOT a graft. It will be interesting to see how yours grows in that climate. It is certainly far from home. Thanks for the info, While I don’t even pretend to know much about the wide variety of plants in the Southwest, it is always good to learn a new tree that may fit someones landscape. That one looks like a winner for those in it’s climate. About a foot a year. I have heard that it can speed up after it is really established. Of course your climate will influence it a bit. A fantastic high canopy shade tree! Plated two from root stock at my old residence. One (podded) female and one (podd-less) male. Grew from 6′ at planting to >30′ in 16 years. Will be planting four at our new home. All will be Espresso®. trunk. Any clues as to what is causing this? We can send pictures if you will tell me how. Thanks! Trunk damage most likely. Perhaps caused by line trimmer or lawn mower running into. It should heal over with time. We know it is not from lawn mower or trimmer damage. The tree is mulched in a 6 foot diameter. We deep water the base of the tree every Wednesday to make sure the roots are staying wet. Could excess water around the roots cause it to crack. The cracking is an up and down the trunk, like dash lines for about 5 feet up the trunk from the ground all in a straight line on east side of tree. Thanks for answering our 1st question. Kentucky coffee trees develop a very corrugated bark, starting when the stem reaches about 1.25″ in diameter. That ” corrugation ” starts out as intermittent vertical stripes, much like what you have described. It may just be that what you are seeing is normal bark development. 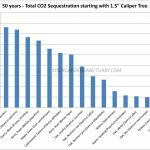 Kentucky coffee trees don’t normally suffer from borer damage, but that is also a possibility. I would suggest taking a photo of the bark issue and going to your county extension agent. Hopefully it is normal bark growth. A side note: Unless you have very sandy soil and live in a particularly hot and windy environment your K.C. trees shouldn’t need to be deep soaked that often, especially since you have nice big mulched tree rings around them. This is one of the true beauties of K.C. trees, they are very drought tolerant and you may actually be over watering them if you don’t have porous soil. You have chosen a great tree. Hopefully the bark issue is from growth. Thank you Doug. We appreciate your comments and are anxiously awaiting spring to see new growth! The advice about watering was much appreciated because we probably are over watering. We both grew up in sandy and rocky soil and have had to water, water, water to keep our trees growing. But here, the soil is more compact and does hold the water well. So thanks again, those cracks I talked about seem to have healed over.